LONDON, England (CNN) -- The wife of an Iranian pro-reformist activist detained as he tried to leave the country last week says she is "deeply concerned" for his safety. 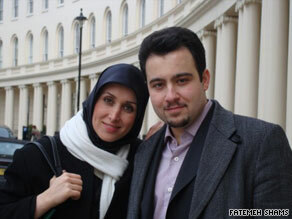 Fatemah Shams and Mohammadreza Jalaeipour are students together at the University of Oxford. Fatemeh Shams told CNN she hadn't heard from her husband Mohammadreza Jalaeipour since she watched him being escorted away after he was prevented from boarding a flight to Dubai on June 17. Both are students at the University of Oxford and had been returning to the UK from Iran after attending a family wedding, just as demonstrations escalated following presidential elections earlier this month which have plunged Iran into political chaos. Shams said she and her 27-year-old husband -- both activists for the pro-reformist Third Wave campaign -- planned to leave Iran on June 17. At first, everything appeared fine with Jalaeipour having his passport stamped as he passed through immigration. But he was then approached by a plain clothes official who told him to turn off his cellphone before ordering Jalaeipour to follow him. Shams said she hadn't heard directly from her husband since his arrest but believed he was being held in prison. "It's a very difficult mental situation for me to understand what is going on and I am deeply concerned about his health and safety," she told CNN. Both Jalaeipour and Shams were members of the organizing committee of the Third Wave campaign, a reformist youth movement formed last year to back former president Mohammad Khatami's candidacy in this year's election. Following Khatami's withdrawal from contention, the Third Wave threw its support behind Mir Hossein Moussavi, who has disputed President Mahmoud Ahmadinejad's re-election, claiming that voting was rigged. In a recent interview with the Wall Street Journal Jalaeipour said he had advised Moussavi on using social-networking Web sites, such as Facebook, to reach young voters. "Third Wave was a totally legal campaign with reformist tendencies that was trying to get young people involved in the elections," said Shams. "We believed we should take part to make our country better and to have a better future. We were encouraging young people to not be indifferent about their country." Shams said she thinks he may have been detained because of his political activities. "Most of the activists who have been supporting the reformist candidate, all of them are in prison now. Why should the young people who want to do something for the sake of their country and their people, why are they in prison now?" Shams said she planned to return to Iran herself if there was no change in her husband's situation in the next week or so. But she but admitted her own safety could not be guaranteed if she went back. Following more than a week of daily demonstrations in Tehran, Iranian security forces have been cracking down on protests and arresting activists including Ebrahim Yazdi, a former deputy prime minister who headed a group supporting increased freedom and democracy. Yazdi, who is 76 and has suffered prostate cancer, was later released. Moussavi and former president Khatami have sent a letter to Iran's courts urging them to release arrested activists and protesters.